Biting is a rabbit's way of communicating a variety of messages including fear, bossiness, irritation, curiosity and even lust. Rabbits frequently tell each other to get out of the way with a nip. Hands near a rabbit's face can be seen as a threat or intrusion. Do not greet a rabbit by offering your hand to be sniffed. Put your rabbit's cage on the floor so he can come out on his own. Make sure he is out of his cage when you reach in to fill his bowl or litter-box. If you must reach into an occupied cage, gently push your rabbit's head to the cage floor and cover his eyes with one hand so he cannot see you reach into his home with your other hand. Use a high pitched "EEEEEK! ", followed by a firm, but non-aggressive "nooooo" to let your rabbit know that his bite hurts. Placing your hand on his head and pressing down gently will help him understand that you are the boss. Never push his head down in a violent or punishing way. Rabbits do not understand punishment. Unspayed/unneutered rabbits tend to be much more aggressive. Unspayed females are particularly territorial, if they are going through a real or false pregnancy. Territorial behavior may include lunging, grunting, boxing, scratching, kicking and biting. If your rabbit is not spayed or neutered, the surgery is recommended. Need Help With Your Aggressive Rabbit? 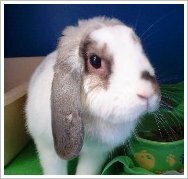 If your rabbit is spayed or neutered and you've tried the above steps but your rabbit is still acting agressively to you, please call (414) 431-6173 or email or behavior team at behavior@wihumane.org. A behavior expert may be able to help you with your rabbit's aggression.